A new permanent gallery opening at the National Museum of Scotland in Spring 2019 will offer an insight into ceramics as a versatile artistic medium and a practical material. The Art of Ceramics will celebrate the creativity found in ceramic pieces from around the world and across a broad time period. 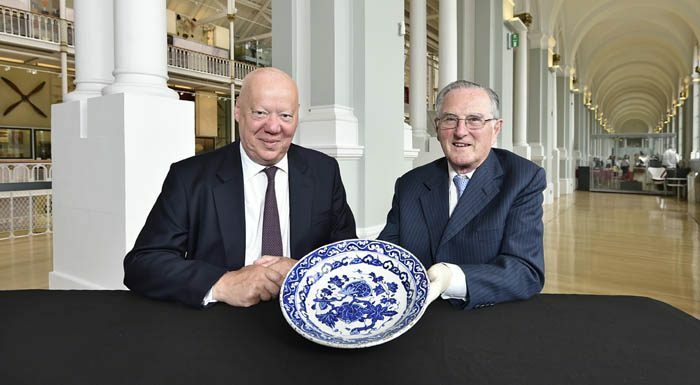 Its creation has been made possible by funding from The Sir James Miller Edinburgh Trust and it will be known as the Sir James Miller Gallery, in memory of Sir James Miller, a Scottish businessman and politician, who served as Lord Provost of Edinburgh and Lord Mayor of London. Ceramics are one of the earliest man-made materials, dating back around 30,000 years. They have been a global artistic medium for millennia, employing an immense variety of technologies, forms, styles and designs. The properties of ceramics mean that they have wide application across industry, science and technologies, and they have been a key component in global trade for thousands of years; as vessels for products, and as objects of desire. Objects on display will include both artworks and ceramics with scientific and technological applications. Highlight objects will include an 18th century Meissen dish made for the Stadholder of Holland, Willem V Prince of Orange; highly decorative ancient Greek pottery; an earthenware figure by contemporary Dundee artist Stephen Bird; a Persian 13th century bowl in a turquoise blue glaze and the nose cone from a British Aerospace Skyflash air-to-air missile. Art of Ceramics will open alongside two new galleries devoted to ancient Egypt and East Asia, as part of the final phase of the ambitious £80 million transformation of the National Museum of Scotland.